While most of our recipes here in MyFreezEasy are super quick to prepare and require very little pre-cooking, this is one exception. Enchiladas are such a great freezer to table meal, and while they do take a little longer to prep...the reward is worth it in the end. Open the can of green chilies. In large mixing bowl, combine the sour cream, green chiles and chicken broth. Stir in the garlic powder, salt and pepper to taste. Scoop out 1 cup of the sour cream sauce and set aside. Stir in the rotisserie chicken. Then spoon sour cream-chicken mixture into the flour tortillas. Nestle each enchilada in the prepared baking dish, seam side down. Assemble all the enchiladas into the baking dish (10 to 12 enchiladas should fit cozy in the baking dish). 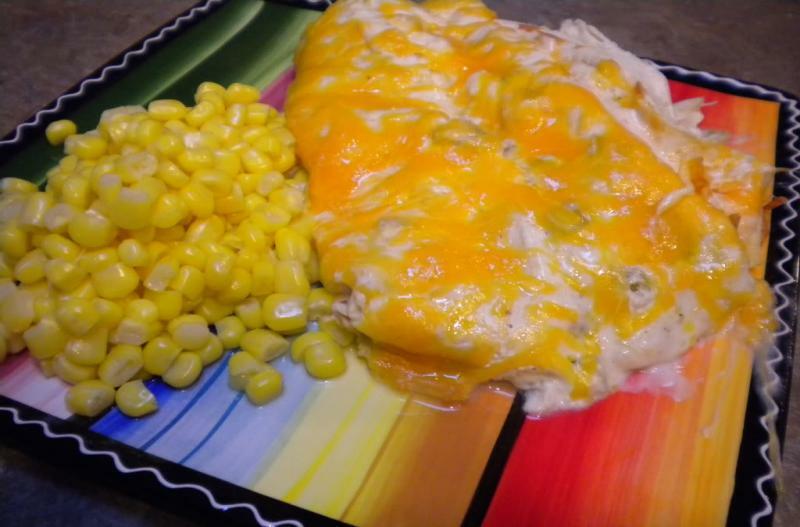 Pour the reserved sour cream sauce over the top. Then top with shredded Pepper Jack cheese. Bake in the preheated oven for 15 to 20 minutes, or until cheese has melted on top. 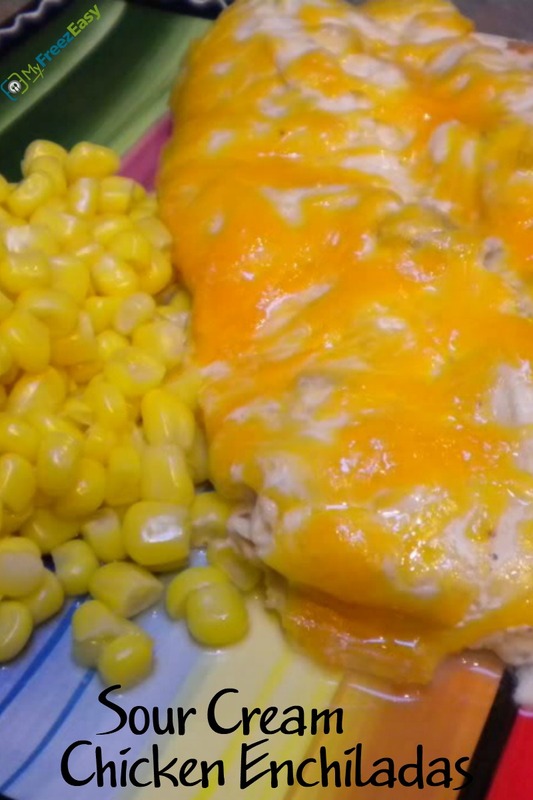 Serve Sour Cream Chicken Enchiladas with veggies. Open 2 cans green chilies. In large mixing bowl, combine 3 cups sour cream, 2 cans green chiles and 1 cup of chicken broth. Stir in the garlic powder, salt and pepper to taste. Scoop out 1 cup of the sour cream sauce and set aside. Stir in the 4 cups shredded rotisserie chicken. Then spoon sour cream-chicken mixture into the flour tortillas. Use corn tortillas to make this a gluten-free meal. Thaw and bake at 350 F for 20 minutes.